Aerial or atmospheric interference with visual perception causes loss of contrast, detail and sharp focus. The effect, which Leonardo called "the perspective of disappearance," tends to make objects seem to take on a blue-gray middle value as they increase in distance. This effect is used by film makers to give the illusion of great depth, but can be used to great effect by painters and draughtsmen. The illustration above shows loss of color saturation, contrast, and detail as the cubes fall further away from the viewer. 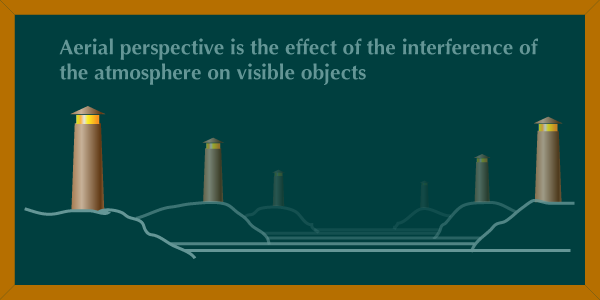 SIZE OF OBJECTS-smaller objects seem farther away (distortions can occur if objects are the same size or too close to the viewer). OVERLAPPING OR SUPERIMPOSING-by partially covering one object with another it gives an appearance of depth (distortions also occur if viewer is too close). TEXTURE-density increases as an object gets further away. SPACING-objects clustered closer together seem farther away. Horizontal lines which get closer as they near the horizon line appear to be defining a recession in space. FOCUS-objects lose detail as they recede into space. BRIGHTNESS-objects are brighter when closer to the viewer, except for reflective surfaces. SHADE AND SHADOW-darker shadows seem closer especially if overlapping other shadows. UPWARD ANGULAR LOCATION-creates depth if juxtaposed to ground and sky lines, e.g. tall buildings. COLOR-color intensity is much greater closer to the viewer and tends toward medium gray as it recedes. Hint: As objects recede away from the viewer in atmospheric perspective, bright whites and rich blacks tend toward medium gray and eventually disappear into a blue/gray background. Even colors have greater intensity closer to a viewer than they do further away. Sometimes an artist describes aerial perspective by allowing the white, or color of the paper to dominate as the depth increases. A good example of this occurs in Claude Lorraine's Landscape with Ruins, Pastoral Figures, and Trees from between 1643-1655.